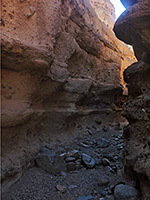 The northern third of 65 mile-long Lake Mohave is bordered by high walls of solid rock, so the relatively few side canyons tend to be steep, and not easily explorable, though there are some exceptions such as Goldstrike Canyon. 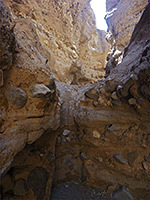 To the south, the cliffs give way to wide alluvial fans and more gently sloping, lower relief terrain, and here the tributary drainages are more numerous, and much branched. 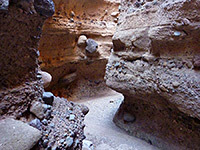 The majority are wide and shallow, with sandy or gravelly floors, but some form short sections of enclosed narrows, up to 100 feet deep. Most parts of the lengthy shoreline are inaccessible overland, owing to the lack of roads, so not many of the canyons have been explored, but there is one interesting, easily reached area on the west side of the lake, at the end of the paved Highway 165, just north of Techatticup Wash. A short distance further north are two adjacent, unnamed drainages, both forming slots near their lower ends. 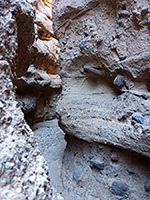 The rocks are conglomerate, a mix of sand and pebbles typical of desert areas, generally colored light brown to yellow, and quite pretty when illuminated by reflected sunlight. The passageways contain a few chutes and dryfalls but no major obstacles, and the floors are generally flat gravel. Highway 165 is 18 miles long, initially quite busy, as far as the town of Nelson and the nearby El Dorado Mine, a popular tourist destination. The latter section is less traveled, since there are no facilities or trails by the lake. 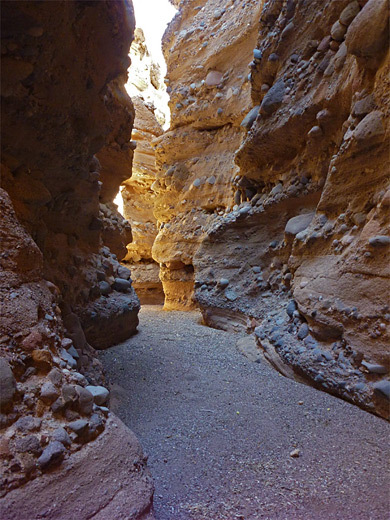 The road reaches a highpoint of 1,065 feet then descends steadily, following the shallow canyon of Techatticup Wash. The last few miles pass gravelly washes and barren ridges, densely covered by teddy bear cholla in one stretch, otherwise very little vegetated; just a few opuntia and echinocereus cacti grow at the lowest elevations. The road ends in a circular parking area on a promontory, 150 feet above the lake; faint paths lead down to the shoreline. 32 views of the canyons; gallery, slideshow. 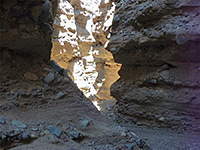 The slots are found along the second and third (and also the sixth and seventh) canyons to the north, the first pair are close by in a direct line - a quarter and three quarters of a mile respectively - though cross-country hiking is more difficult than might be expected owing to the loose gravel that covers all surfaces, so easily-traversable gradients are rather less than if the ground was firmer. 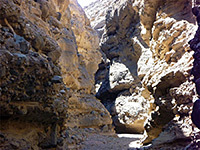 Washes hereabouts are lined by short sections of sheer cliffs, but mostly by stony slopes, with plenty of entry and exit points, and the slots occur along the lower sections, close to the lake. Canyon mouths are choked with willow and tamarisk, while the remainder of the drainages are almost unvegetated, apart from occasional wildflowers such as desert rock nettle and desert milkweed. Walking is very easy in the ravines, once away from the bushy patches near the lake. 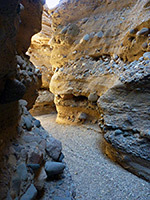 Between the canyons, the shoreline is often bushy, but some other parts are open, bordered by pebbly beaches or flat, rocky terraces, good for swimming and paddling. Beyond the nearest canyon to the north of the parking area - a shallow drainage with no slots, but two south-side tributaries that complicate the crossing - the land rises to a low ridge and drops down to the next streambed, which leads to Techatticup Cove, so might be named Techatticup Cove Canyon. Its south fork is narrow and sheer-walled but is not fully enclosed, while the larger north fork does have a short slot, ending upstream at a chute of about 15 feet. Apart from this there are no obstacles, and the floor is smooth gravel. The next ravine - North Techatticup Cove Canyon - also has a semi-enclosed south fork beneath tall cliffs, but the main slot is along the north branch. Upstream, this narrows quite slowly but eventually has plenty of pretty passageways through attractively-textured rocks; alternating bands of smooth pebbles between finer-grained layers. The cliffs above are not overhanging so there are no especially dark passages. The upper end of the slot contains a few small steps, leading to a higher fall that marks the end of the narrows.